To me laundry is a form of punishment that I rarely want to endure. Sadly, the trip budget doesn’t include buying new clothes to replace the dirty ones so that means laundry is a must. Living in a small space like Wendy (our travel trailer) means we’re always on the look-out for lightweight versions of everyday items that use up less space. 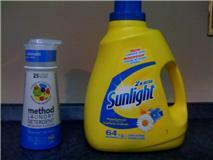 So, if laundry is a must then finding a small detergent solution is also important. I like the fact that it’s environmentally friendly and that Method’s bottle uses a pump system (two pumps for a small load, four for a medium load. etc). The reviews were favorable too! Although it is pricey – $9.99 for a 10 oz bottle that does 25 loads – the size makes up for it, and it’s more economical than replacing my wardrobe! I’ll give it a shot and let you know if it works out. If you have other suggestions, let me know.